Ever get tired of Spaghetti in its normal way? Try this. This is a casserole that is popular in the south, this is a great way to use up left over chicken. Chicken, canned soup mix, spaghetti, cheese and more make a hearty casserole. I have made this with other types of noodles and it has turned out well. 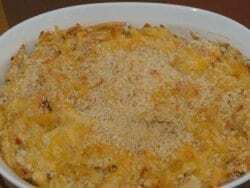 Cheddar Chicken Spaghetti is an easy chicken spaghetti casserole you can make, the whole family loves this casserole. Cook spaghetti in boiling salted water with garlic salt, rinse with hot water. Saute onion in butter until brown. Mix all ingredients except cheese and crumbs. Sprinkle with cheese and cracker crumbs. Bake for 25 minutes at 350 degrees. Add a can of diced green chilis for a kick. Just made this. OMG amazing!!!. Add 2 cans cream of chicken though! sounds like a delicious comfort food! Growing up in Texas, I have had this many times! So good, and so easy to make.